Over the holidays, we spent a few wonderful days with friends and family in the Cincinnati area. The occasion was the closing of the historic Southgate House, in Newport, KY. 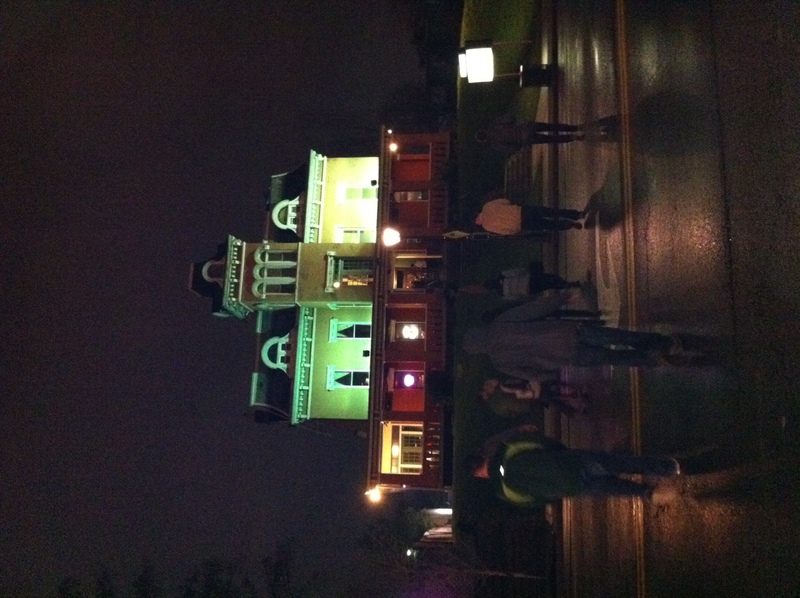 Situated on a hill overlooking the city of Cincinnati, the Southgate House was an amazing place. A mix between a live music venue, smoky oldtime-style lounge (with a fantastic jukebox), art gallery, and pool hall, the Southgate House had something for everyone. Back before we all had families of our own, jobs, etc., we’d spend nights watching amazing bands/artists perform live at Southgate. Jerry Jeff Walker, Iris DeMent, Ralph Stanley, Elliot Smith, Yo La Tengo….the list could go on and on. We’re all over the place now (from Virginia, Ohio, Michigan, Kentucky), but got together on 27 December for the V-Roys reunion show. The show was fantastic…and the whole affair brought back loads of memories with wonderful friends. 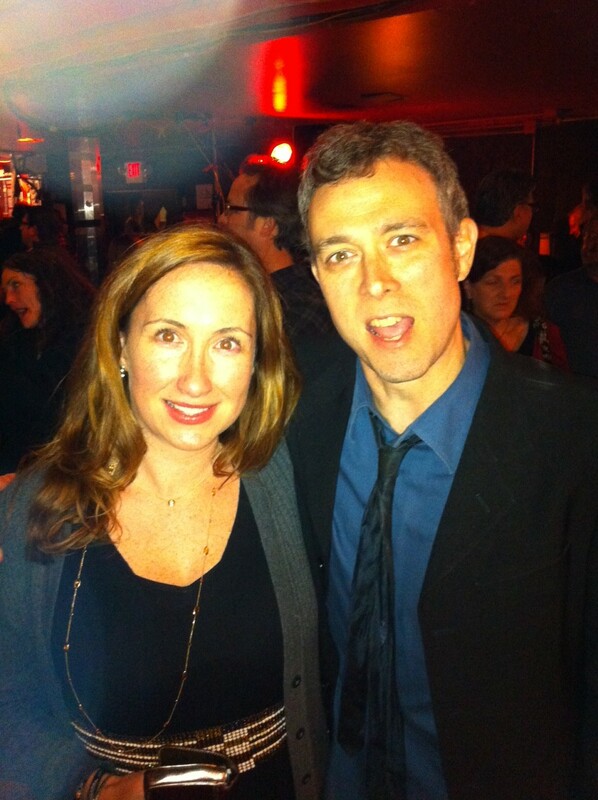 Here’s me with the lead singer, Scott Miller. Of course, I got a few good runs in while we were in the area. I always love a change of scenery, and running past the 1800’s-era riverfront mansions and beautiful churches of Newport and Covington, KY (where we stayed) was a real treat. I started by the Roebling Bridge (an early model of the Brooklyn Bridge) and ran through the Riverside Drive Historic District and Riverwalk Statue Tour. Here’s a 360 of the starting point. I also ran past the Newport Aquarium (where we later took the kids). If you live within 200 miles of this place and have never been…SHAME! It’s one of the nicest and most accessible aquariums we’ve ever visited. 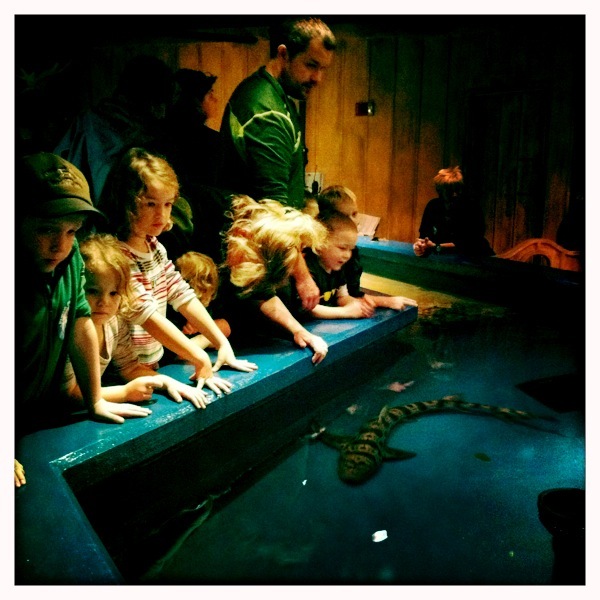 My kids got to pet sharks and are fans for life. Thanks to everyone for your views and support in 2011! Happy Running and Happy New Year! Mt. Vernon Run and Giveaway Winner Announced! I may be super behind with posting due to the holiday craziness (i.e., multiple parties, Christmas recitals, shopping,”baking” 8 dozen cookies* for work cookie exchange, etc. ), but I’ve luckily managed to get in some super runs. 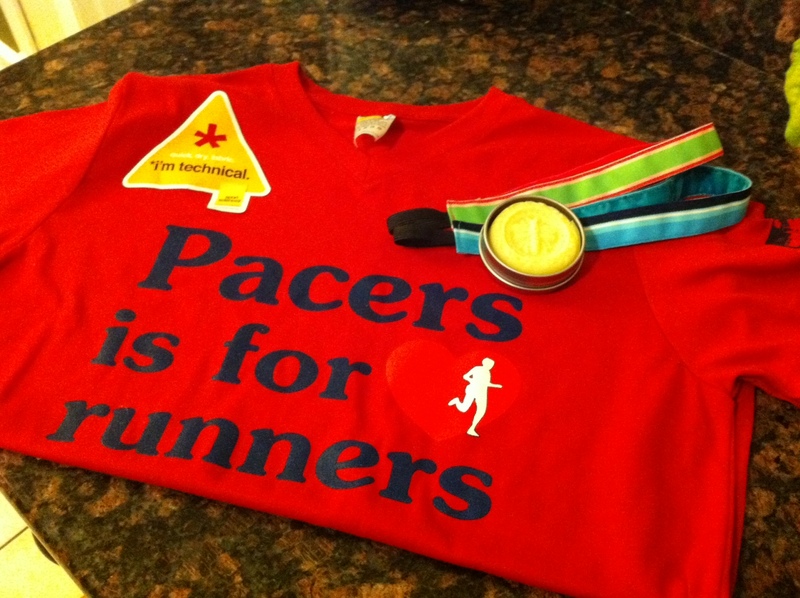 First things first, though: CONGRATS to Joe L for winning the December “Small Business Running Swag” Giveaway! I’m sure Joe is anxiously awaiting the arrival of his women’s size medium running shirt, headbands, and organic lotion bar. I guess a random drawing is just that: random. Enjoy, Joe! So back to running: this weekend’s long run traversed the very challenging and scenic Mt. Vernon trail. For those of you who are unfamiliar with the area, the Mt. 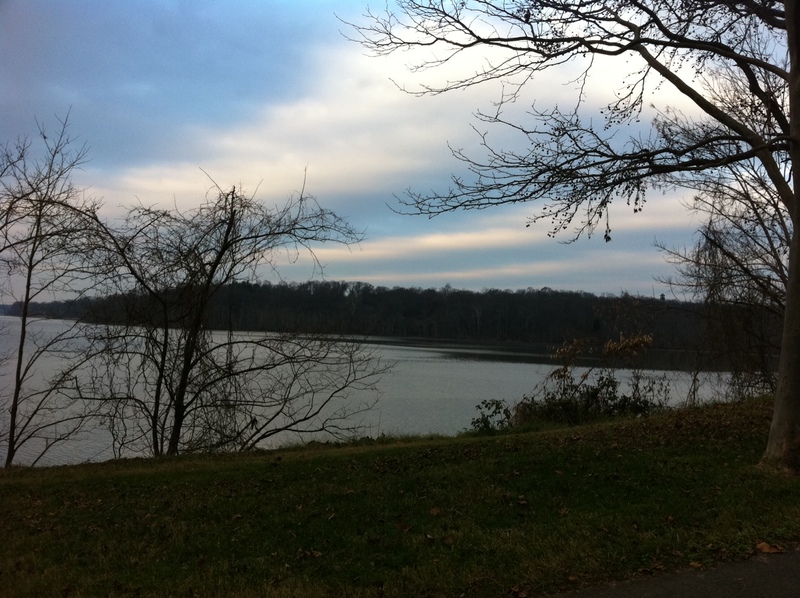 Vernon trail runs 18 miles alongside the Potomac River, from Teddy Roosevelt Island right up to the Mt. Vernon estate- the gorgeous and historic home of George and Martha Washington. My husband and I met up with Pacers “fun run” group on Saturday morning at Riverside Park (right off the GW Parkway). On the drive up, we actually spotted a bald eagle perched in the trees overlooking the river…it was amazing, and I wish I’d been quicker with the camera. 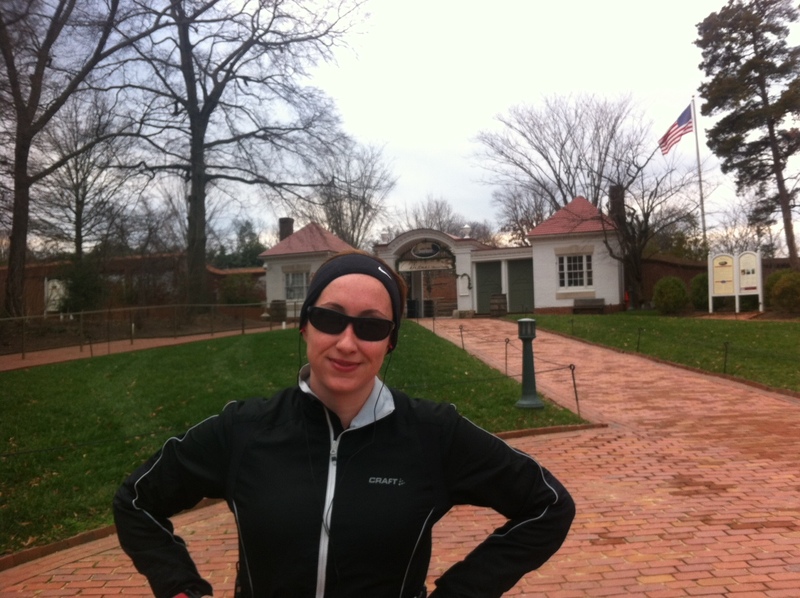 After a quick warm up, we ran just over three miles in the direction of Old Town Alexandria. Closer to Teddy Roosevelt Island, the Mt. Vernon trail is relatively flat and fast…but in Alexandria the trail turns hilly; definitely a challenging course. After the turnaround, we picked up speed, stopping only briefly for water at our Riverside Park starting point before making the way up the final hill to Mt. Vernon. I’d been warned about this hill by a reader after my recent post on hill work. Previously, I’d only run DOWN the hill (during the Pacers GW Parkway Classic 10 miler). I’ll spare you the details of my grueling/exhausting ascent, but what I will say is this: if you’re looking for a tough hill workout, run this course! But seriously, you can’t complain when you end up at a place like the Mt. Vernon estate. We arrived before the crowds and got to enjoy a few moments before heading back to Riverside Park. 9 miles, total! Happy Running! * And by “baking” I mean convincing Heidelberg Bakery to make me a very homemade looking tray of their amazing Mexican wedding cookies. 8 dozen of these tasty treats only cost me 16 bucks! Holiday Small Business Swag Giveaway! Express my appreciation to the nearly 2000 readers I’ve had since starting this blog (yay!). Highlight just a few of the fantastic small businesses that I support. One (size M women’s) Sport Science technical shirt from my favorite local running store, Pacers. Readers of this blog know how much I love Pacers. It’s the first place I go for shoes, clothing, gear…and most of all, support/advice. I’ve been running with the Pacers Distance Training program for several years and absolutely depend on the amazing coaching and comradery. Pacers provides a personal touch that only a small, local business can achieve…so it’s no surprise they were voted as one of the Competitor Top 4 running stores in the United States; congrats Pacers! Two (yes, two!) 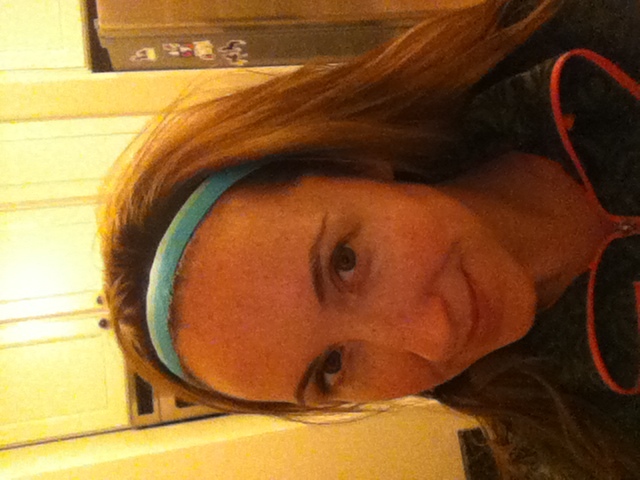 running headbands by Happy Medium Crafts. Expertly constructed with ribbon, elastic, and a non-slip velvet lining, these headbands STAY PUT even on the longest runs. Hang out at the track in Arlington, and you’re sure to see multiple ladies sporting these headbands in a variety of customized colors. I’ve included both a pink and blue for this package, but if you’re interested in custom ordering others, contact Happy Medium Crafts directly at happymediumcrafts@gmail.com. One band for $8, two for $15. It’s a deal! 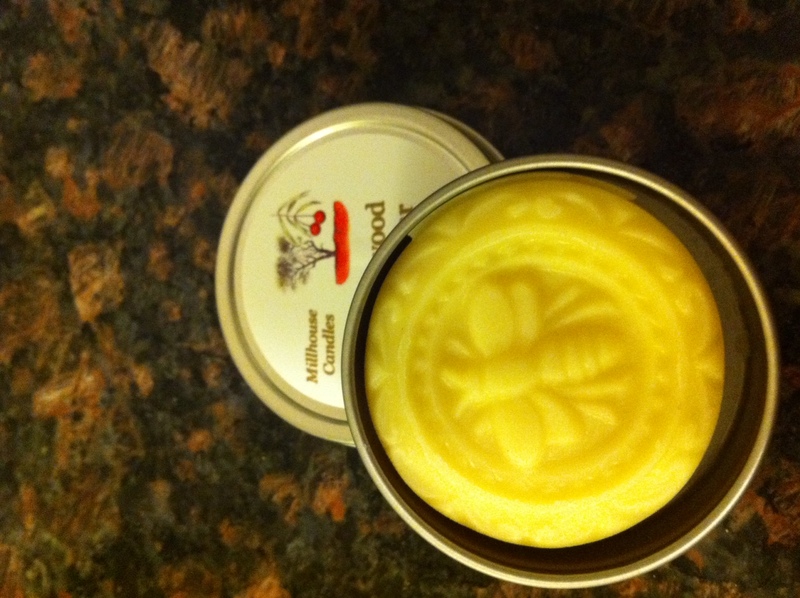 Lastly, one super-rich lotion bar from Millhouse Candles. It’s not fancy soap….believe it or not, it’s actually a mini solid lotion cake. With its unique beeswax-shea-cocoa butter formula, this innovative new product is perfect for soothing dry/cracked skin and (when applied in multiple layers) preventing chaffing on those long winter runs. At $5 a bar, it’s a great stocking stuffer or gift for your running partner. Are you excited? Entering the contest is easy! Simply click the comments section on this post and tell me your favorite race of 2011. In just a few words, talk about why you loved the run. One winner will be chosen at random on 20 December, and I’ll ship the package out immediately. Good luck, and thanks for your support of this blog and small businesses everywhere! 7.10 mile run today, starting at the Iwo Jima Memorial, around Arlington National Cemetary, across Memorial Bridge, around the White House, K Street, Georgetown, and back home via the Key Bridge. Gorgeous (but chilly) day, perfect for running and snapping pictures. Mile one took me by Arlington National Cemetary. It’s one of the most solemn and beautiful places in the country, and you can’t help but reflect upon the countless sacrifices made by our service members over the years. My grandfather, a U.S. Army Colonel and veteran of both the Korean Conflict and the Vietnam War is buried there, as are many other heroes and military dependants. For the past 20 years, a small Maine-based company, Worcester Wreath Company, has been organizing wreath laying on headstones throughout Arlington Cemetary. 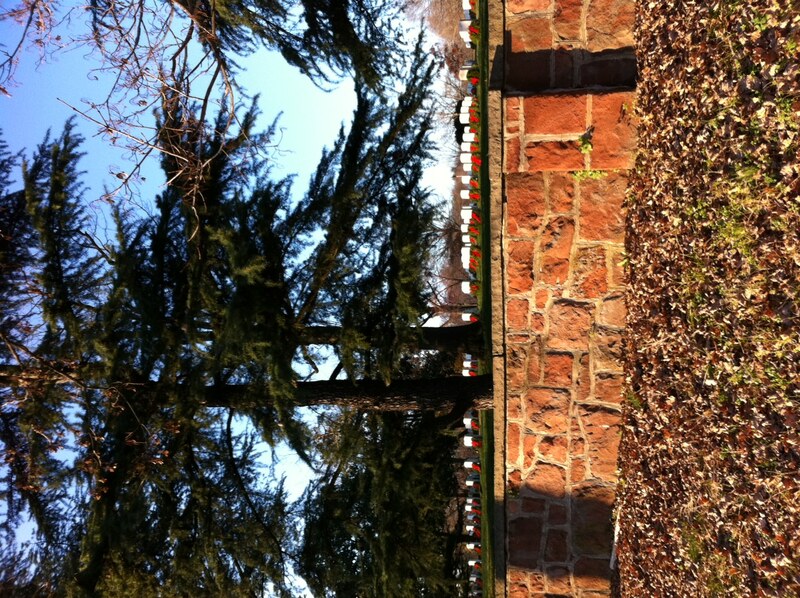 This year, volunteers placed nearly 100,000 wreaths. The Washington Post did a very moving write-up on the effort in today’s paper. Click here to read it. 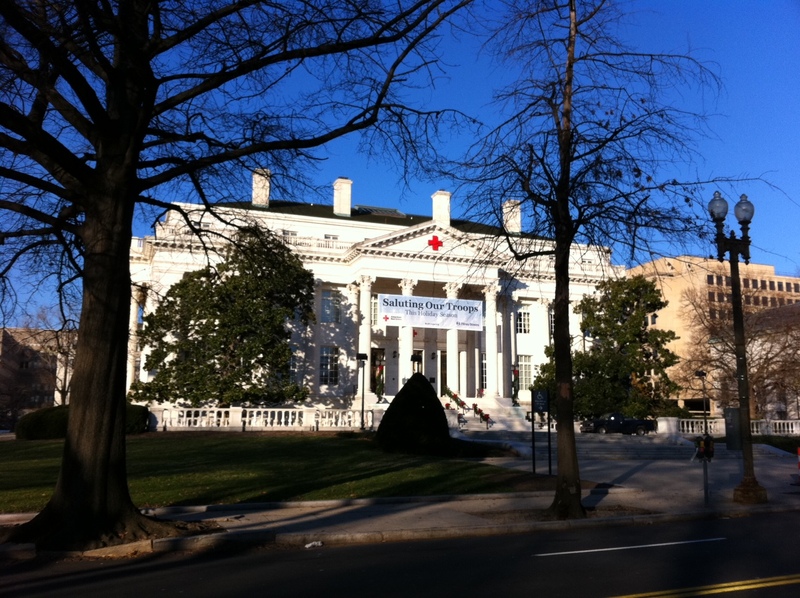 Midway through the run, I passed by the American Red Cross historic headquarters building, looking over the south lawn of the White House. For those of you who might not know, the American Red Cross offers a quick and easy way to send your support to service members overseas with their Holiday Mail for Heroes Program. Please consider taking a few moments to share your gratitude this holiday season! Was thoroughly impressed with Mike’s dominance over the hills in Saturday’s Hot Chocolate 15k, so I decided to “treat” myself to a challenging 5k. When you’re looking for hills in Arlington, there is no shortage of choices. For short repeats, I like the Custis Trail or Rosslyn, overlooking the Iwo Jima Marine Corps Memorial (also one of my favorite start/finish points for long runs). 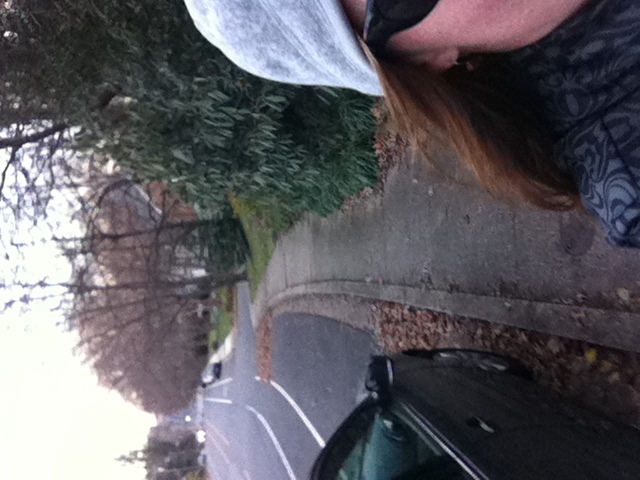 I opted for the grueling…and seemingly never-ending, Lorcom Lane in North Arlington. I jogged down to Spout Run/66 and began the ascent, pausing only to take a photo. Lorcom Lane is both steep and long; it’s the kind of run that, during the summer, I refuse to do without a waterbelt, regardless of the overall planned distance. 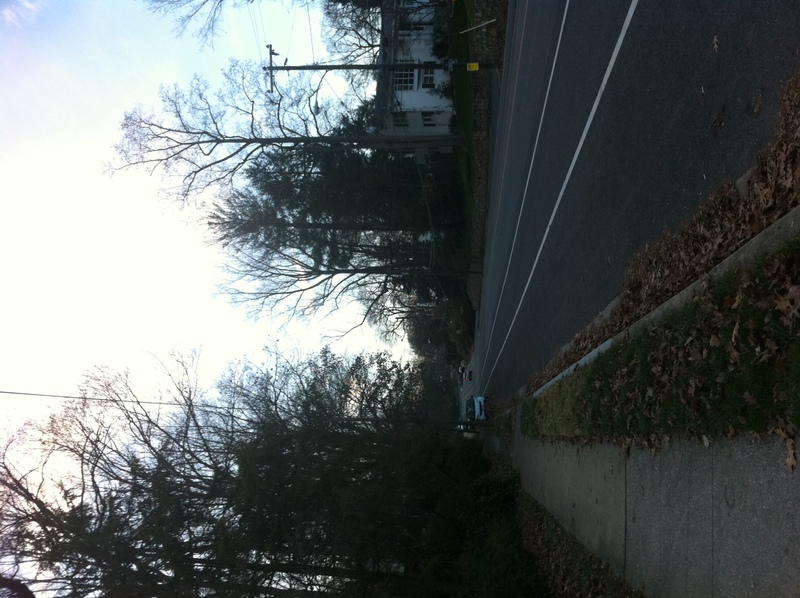 When the weather is cool enough (like this week), I do the run without water…but still feel beat when I hit the top. I finished my hilly 5k in just under 30 minutes. Not an impressive time, but I wasn’t going for speed. What’s your favorite local hill?